Set in 1995, “Captain Marvel” follows Carol Danvers (Brie Larson) as she becomes one of the universe’s most powerful heroes when Earth is caught in the middle of a galactic war between two alien races. The film was highly anticipated by audiences as it was the first female-led film in the Marvel Cinematic Universe (MCU). With its callbacks to the 90s era and the cast’s heartwarming, fierce, and funny dynamic, “Captain Marvel” provides audiences with an entertaining and bright experience that calls back to “Phase One” origin stories such as “Iron Man” and “Thor,” but still presents something fresh and different. We’re first introduced to our heroine as Vers (pronounced “veers”), a Kree warrior who is part of an elite Starforce fighting in a war against the Skrulls, a race of shape-shifting aliens. She suffers from nightmares of a life she doesn’t remember, and her mentor and commander, Yon-Rogg (Jude Law), is training her to control her abilities. After a mission gone wrong and escaping after being taken hostage by Skrulls, Carol ends up on Earth and working alongside a de-aged Nick Fury (Samuel L. Jackson) to find out what the Skrulls want with Earth and how she is connected to it. This leads to a story of self-discovery, with Carol struggling to find out who she was before she was a part of the Kree Empire and reconcile that with who she’s become. A recurring theme across the film is Carol’s struggle against others attempting to delegitimize her and her capabilities. When she is trained by Yon-Rogg, he chastises her for resorting to her Kree-granted photon energy powers when fighting, rather than encouraging her to use them to her advantage. In her memories, she is told several times that she will never be made an Air Force pilot because she’s a woman. She is constantly facing people who underestimate her but every time proves that she is worthy of her powers and positions, reiterating the film’s mantra—higher, further, faster. This relays into a message to audiences, as well; throughout the film, Carol is constantly told that she needs to control her emotions in order to be better and fight better. This is a message that women in real life have forced down their throats every day—that having emotions is somehow a weakness. However, Carol’s emotions end up being the key to unlocking the full potential of her powers. The part of her that is human is her greatest strength. A huge part of the movie’s appeal is the time period in which it takes place. Elements such as Carol crashing into a Blockbuster, characters using pay phones and pagers, and a soundtrack featuring hits from Nirvana, R.E.M., and Salt-N-Pepa, call back to the 90s era that invokes a sense of nostalgia that is fun for both parents and children alike. Ben Mendelsohn’s Talos will be a surprise for die-hard Marvel comic fans, but still a well-done one. The infamous Skrull commander brings a different kind of villain to the MCU, more humorous than devious, but still provides an in-depth and complex character that the audience can appreciate. Undoubtedly, one of the highlights of this film is Jackson and Larson’s playful, bantering relationship. Larson’s fiery and stubborn Danvers perfectly complements a version of Fury we haven’t seen yet—one who isn’t as secretive and stony as the one we’ve encountered in past Marvel films. The two characters push each other in all the best ways, slowly building to a wonderful friendship that is great to watch. Carol’s relationship with her human friend, Maria Rambeau (Lashana Lynch), is one not to look over, either. The two share an intimacy that perfectly grounds all the action and twists the movie otherwise provides. The film’s fun nature doesn’t take away from the message it sends about a different kind of strength. Watching a female superhero on the big screen is empowering for both young girls and boys. Larson’s Captain Marvel brings a new kind of superhero to the table, one who proves that being human isn’t a weakness. It’s a good extension to the Marvel universe, providing small fan service moments that explain histories of certain characters and storylines, such as how Fury lost his eye, and how “The Avengers Initiative” got its name, without disrupting any of the already-set precognitions of earlier movies. 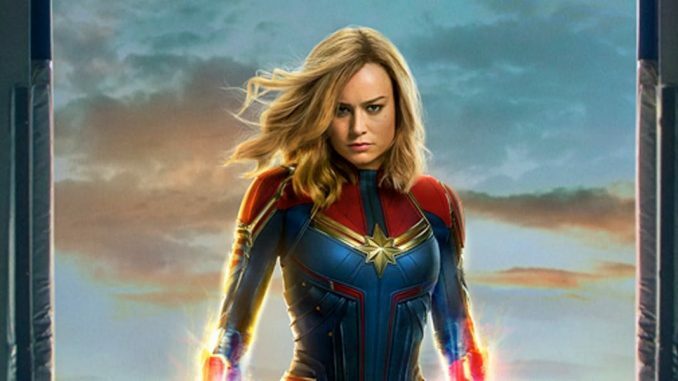 It’s a great segue for introducing Captain Marvel into the MCU, as she is expected to play a major role in “Avengers: Endgame,” which is set to release in April.